There are several outposts of the Vatican Post Office including one near the museum and one of the left side of St. Peter’s Square as you are facing St. Peter’s Basilica. Another advantage of visiting the post office — their stamps are truly beautiful and the perfect souvenir to bring back home for any stamp lover. If you’re planning a trip to the Vatican, reserve a Skip The Line Tour or reserve for a Papal Audience. Ready to plan your vacation in Italy? Perillo Tours has been leading group trips throughout Italy since 1945 and ItalyVacations.com can custom design an independent itinerary for your dream Italy vacation! We are both furious….Help! ver disappointed…. We mailed 4 postcards on Monday October 15 from the Vatican (did the same picture as above so we do have proof we actually mailed them) and still nothing. I guess that is usual? We are very disappointed as we stood in 2 different lines (one to buy the postcards and the other to get the right amount of postage) Should we continue to be patient or just give up as there is no reason to believe that we will ever get them now? Wondering if the above mail was ever delivered? 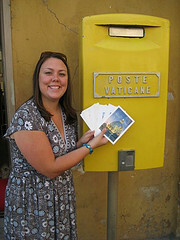 Similarly, we spent over 30E on stamps and postcards Just so we could mail them (to the U.S.) from Vatican City. Did so on 27 December, it is now 13 January and none have arrived, though those sent later, directly from a Rome street mailbox, have been delivered. Vatican city is awesome.the people who said it doesn’t work is dumb. We mailed postcards from that exact post box at the Vatican, and they arrived to us in the USA with Roma postmarks!!! So disappointing! How did that happen?? ?